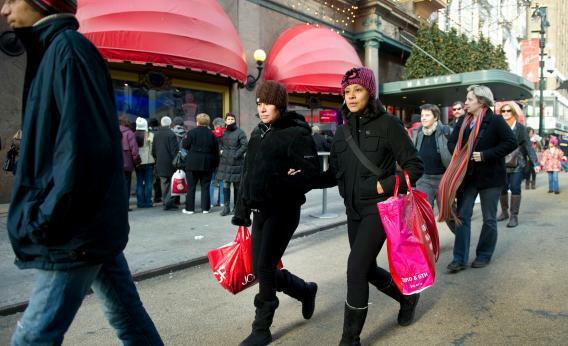 Consumer confidence in the U.S. economy is at its highest since February, but chief executives remain pessimistic. Consumer Confidence in the Economy Is Rising. So Why Are Chief Executives So Pessimistic? Consumers are increasingly confident about the economy, but chief executives remain skeptical. Consumers are feeling better than companies these days, but that might not last long. Cheerier shoppers splashing out more cash could transform business’s bad attitude. But gloomy executives may be more likely to pour cold water on enthusiastic Americans if their pessimism leads to slower hiring. Main Street seems pretty jazzed about the economy. The Conference Board reported on Tuesday that its Consumer Confidence Index jumped to 70.3 in September – the best since February. And the Thomson Reuters/University of Michigan September sentiment measure is expected to hit its highest level since 2007 when announced on Friday, according to the consensus estimate. Several factors account for this. First, the rising gas prices that helped fuel the summer slowdown appear to be stabilizing below the psychologically important national average threshold of $4 a gallon. The housing market is also finally looking lively, with house prices rising six months in a row, according to S&P/Case-Shiller, which reported July numbers earlier this week. Pensions and other investments are looking more robust for many, too, with the S&P500 stock index up 12 percent so far this year. And household balance sheets look healthier as many people have been cutting their debts, according to Federal Reserve data. Yet executives aren’t celebrating. The Business Roundtable reported on Wednesday that chief executive confidence sagged to a three-year low in the third quarter. And finance chiefs feel, on balance, pessimistic for the first time this year, a Deloitte survey shows. Some 60 percent of them worry most about a global economic downturn. Another quarter blame the U.S. government, worrying about looming regulation and the coming fiscal cliff that could hike taxes and slash federal spending. It’s not unusual for one group to lead the other in times of economic uncertainty. With consumers accounting for around two-thirds of U.S. gross domestic product, their confidence ought to count for a lot. But 20 percent of CFOs in the Deloitte survey said that fiscal uncertainty has caused them to delay hiring. And numbers out today lend weight to their fears: durable goods orders dropped 13.2 percent in August and second-quarter GDP growth was revised down to a lowly 1.3 percent. With Europe still struggling and U.S. politicians distracted by November’s elections, executive pessimism looks like it has the edge.